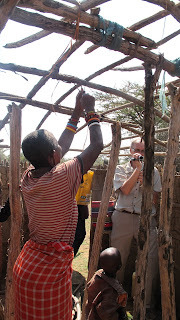 COMPLETING THE HARVEST & THE MAASAI EXPERIENCE!! Florence, Seline and Christine sorting the last few ears to thresh. We have been working really hard, physically, right now - and at the end of the day we surely feel it. We are pretty tired by the time we get home. Often we take a shower - it's pretty grubby work - and then go out for a meal, so that Marty doesn't have to cook. We have had a few people helping us this last week, so we made sure to have tea and bread for lunch. That is a typical snack or lunch, and we have grown rather fond of it. We added some bananas for dessert. Marty learned how to do the fire (everything is cooked outside on a wood fire) it's easy (making the fire). The water for the tea came from the hand-dug well and the water is cloudy because of recent rain. Well, we definitely claimed Mark 16:18, drank our tea, and have suffered no ill effects. We worked all week, but had to take three days off (Wed., Thurs, & Fri.) for the First Annual Youth Conference at the church. On the Thursday, Charles - the wonderful man that overseas the land at the Widows Farm - came and got us to come see what they had been doing. He and three ladies had continued to work even though we weren't there. We hadn't asked or expected them to do it. Their heart was to relieve us of the continual concern of the harvest not getting done because we weren't there. Marty returned on Saturday morning and with Charles and the three ladies we finished getting the maize off the cobs, bagged all that was dry (after winnowing it - the old fashioned way) and now all that remains is to finish drying what was shelled that day and winnow and bag it. Later we will spread all of it out again and add a preservative to it before bagging it in bags that hold 80 kilograms (about 175+ lbs.) We have actually dried and bagged (temporarily) 1000 kgs (2220 lbs) and have about 360 kgs left to dry. The last few ears were really small or misshapen and it was difficult even to do them by hand. No problem! Charles put them in a feed sack and if there was anything evil in that corn he beat the devil out of it with a big stick. IT WORKED! All of those funny cobs were clean and we added the kernels to the lot. Each day we gave the empty cobs to the people helping us - they were delighted, for they are used as fire wood. In fact, we used them in our fire. Rain damaged some of the maize - in that it wasn't harvested quite soon enough and if it was opened and water got in some of it got a mildew-type disease. But that isn't wasted - they took that home and use it to feed chickens and cows. Nothing is wasted! Even what falls to the floor is swept up and sieved to get the dirt out. If it is too bad it goes to the chickens. requires is 3 rocks (we used cinder blocks from the house) - to set the pot on - some paper, twigs and bits of wood, corn cobs, and matches. 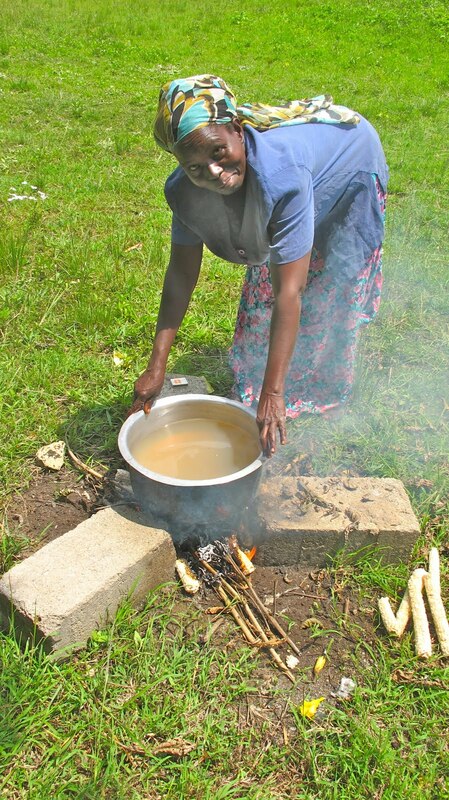 Then, the trick is to keep pushing the sticks and corn cobs in under the pot a little at a time as it cooks. The women are very patient and happy to show Marty how to do these domestic things. However, the dodgy water issue has made us even more determined to get the water-harvesting portion of the farm development completed. That way rain water is collected and there will be no problem with worries over contaminated water. The well wasn't dug for drinking/cooking purposes, but to water the crops. 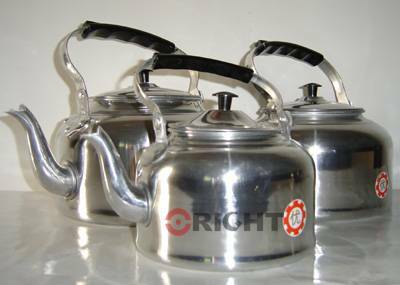 We will encourage bringing water down from the church for cooking the next time. We went to Narok - in Maasai land - for a weekend and had an amazing time. What wonderful people. Not easily accepting of the Gospel, but once one person in a small village (manyatta) comes to know the Lord the rest will accept and believe through that person's changed life. It seems to be a pattern among the Maasai, and it is often through a woman. This zebra was rather annoyed with us for disturbing it! The manyattas (the village compounds) are in the bush - the nearest is perhaps a mile off the highway - and zebras are roaming freely in sight, but other things are in the midst of the bush; lions, leopards, and at night, roaming elephant herds. The Maasai know how to live amongst these creatures and how to fend them off (usually) when necessary. An interesting situation befell the pastor who we were visiting and his wife and a couple of other people with them. A short while ago they were ministering in the evening in the bush at the Maasai church and when they left, the driver took a wrong trail; it had rained and the vehicle got stuck in the mud. However, a herd of elephants showed up, so the folks couldn't get out of their vehicle to push it out of the mud. Elephants and other wild animals there pose a genuine danger and one doesn't get out of their car at night in the bush. These elephants were not interested in going too far away. When they came too close to the car the driver would start the engine and turn on the lights, which was enough to cause the elephants to shy away. The engine and lights were used several times in the night; needless to say there was a whole lot of prayer going on, and no one slept. Elephants can topple a car with no real effort. They were rescued the next morning. Because it is harvest season, and elephants love maize, they tend to come out early in the evening to forage the maize fields. They have been known to ruin entire crops. 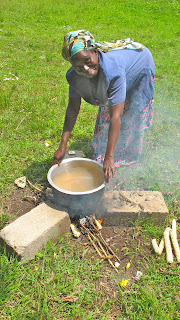 Additionally, they LOVE ugali (oo gah lee) - a very stiff maize-meal dish (it is formed into a "cake" shape and sliced) that is eaten daily by most Kenyans, as far as we know. Elephants will tear a house down to get to it. So, during the harvest, because these herds are out and about at supper (tea) time rather than later, the Maasai have their main meal in the afternoon, including ugali, and then they clean up everything very carefully to remove any scent of the ugali so that by the time the elephants have come out they won't be able to smell it. and there are lots of poles inside . On the left rear is a "room" where the wife and children sleep - about 3.5'X6' - on the right rear is where the husband sleeps - same size. Between these two "rooms" is the living area with the fire in the middle (keeps them warm at night); this space is about 4'x6'. In the right front and at a 90 degree angle to the back was an L-shaped area for a cow and baby goats. The smoke has nowhere to go, although some goes out through the window, so the house if filled with smoke when the fire is going - of course it gets cool at night and the heat from a fire is welcomed. The men are all at the market on Saturdays! An acacia tree is a great place to sit to hear preaching! Thank you for your love and prayer support! Please don't stop either of them. 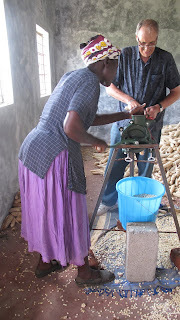 VISITING THE WIDOWS AND THE HARVEST & THE "THRESHING"
Well, we hit the ground in Kisumu/Kadawa with a soft thud and were relatively inactive for the first week. Actually, not inactive, for it takes several days to get settled in to our surroundings. The first two days here were spent in a guest house, until our normal accommodations were available. As it turned out we could move in two days early, which made life a bit simpler. Then we spent time getting groceries and various supplies (it's almost like setting up house) and re-visiting places in Kisumutown where we have established relationships. 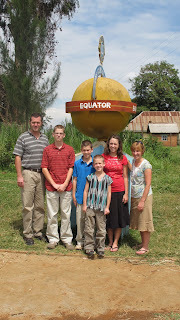 ﻿ Then, our friends, the Kline family, came - Charlie, Heidi, Clarissa, Philip, Cory and Jeremy. Charlie and Heidi pastor a uniquely active church in Myerstown, Pennsylvania - The Fireplace - which faithfully supports the ministry at Kadawa. When we were there in 2010 young Cory - about 8 or 9 at the time - took his savings account of $300, which he had been saving for a certain goal, and donated it to provide a year's supply of water for destitute widows in Kadawa. Life became exciting as the Klines came into the Kadawa village to see first-hand what they are sowing into as a church and a family. First, we visited 3 elderly widows who receive water weekly. They were delighted to meet the Klines. When we told them the story of what Cory had done they were well pleased and thanked him very much. A couple of them explained that because of their age they no longer have the strength to go get water and carry it home on their head. Each widow we visited adopted Cory as their grandson. In each home one or more of the children prayed for the widows and laid hands on the ones who said they weren't well, praying for their healing. It was profoundly touching, and a wonderful, weepy time was had by all. It certainly was a life-changing experience for these youngsters. (Might have been for the adults as well). 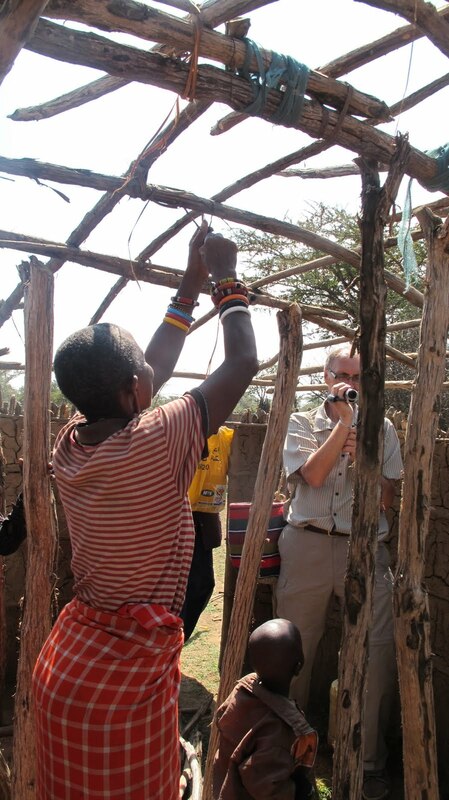 We want to emphasize that the drought in Kenya remains horrifically intense. Here in Kadawa the lack of rain hasn't been as bad as in other parts. The planting is done according to the "long" rains and the "short" rains. This is the time for the short rains, but they are lasting longer than usual, whereas the long rains were shorter than usual. This has cause a lot of confusion about when to plant. Many of the crops have been very poor, including the small crops on the villagers' land. This is due to the unusual rain- patterns and drought in between. The strange weather patterns are being attributed to El Nino. However, as you have seen in our previous photos, our land and the church land has prospered. The Lord has truly blessed our fields and that, along with good managing techniques that He has taught us - proper fertilizer, weeding, and managing the water when the rain does come, has resulted in a crop that far surpasses the first one we did. God has truly taken care of his widows and orphans with this particular crop. We bought this gadget for "shelling" the maize. It's a corn thresher - or maize sheller as they call it here. We bought this hand operated one ($35), had a stand made for it out of steel ($15) and we tried it out.. One of the widows - our neighbour, Florence - came over on some business. We invited her into the store/barn to see what we had bought. You see; traditionally the maize is all stripped off the cobs by hand and it takes a whole bunch of people a long time to do it. It is a great fun time - all sitting on the mat on the ground, or on the floor chattering and laughing and, of course, having a meal because it is an all day (sometimes all week or several weeks) event. We didn't want to interfere with the camaraderie, but also DID want to speed up the process. Well, this one-man machine, which is actually an Amish contraption, isn't going to break up that kind of thing, but it will help speed the process up. You put the cob in the top, turn the handle as fast as you can, and the cob spins around, the teeth force the kernels off the cob, and the when the cob is clean,the machine turns it and spits it out the back. Pretty slick!! Back to the neighbor: she speaks very little English, but when she saw it and watched John operate it she was grinning from ear to ear and then said "I must do this work". Translated that means "Oh boy! Let me have a crack at this!" She caught on right away - recognizing when the tension needed adjusting and was turning the various wing nuts and bolts. The maize extends down the 15 ft. wall and around trhe other corner! ﻿ The two of us began the shelling the maize on Monday. Then found the stand for the "thresher" needed some modification. So John and Charles - the pastor who helps on the farm - went into Holo Market - the market place at the entrance to the village - and had a welder do the modifications. Removing a steel bar, putting a longer one on a bit lower down, cost less than $1 (60pence). Then we worked in earnest all day Tuesday. We found out a few more modifications to be made to the stand, but can continue to go right along in the work. It is hard and still takes a long time, but it was just the two of us. On Wed. Florence came by again and she stepped right up to help us. With 3 people working at it the task went much faster, and we really got a system going. Each bucket holds 14 kilograms (about 31 lbs.) We spread the shelled maize on tarpaulins to dry - it takes two days in the sun - and then we bag it. (We need to winnow it - the old-fashioned way) and then will add some preservative to protect it from weevils. In three days we have done nearly 1000 lbs. - the two of us on Mon. and Tues. and the with Florence on Wed. We haven't done even half of the harvest yet. It is hard work - especially hauling in the maize after it has been drying awhile - but it is a great source of satisfaction at the end of the day. And BOY are we learning a lot. For instance Florence showed Marty how to tell by feeling a hand full of maize if it is dry enough to be bagged. John has found out how to go about modifying the stand and finding the right people to do the job. We have both learned how to sort and shell and winnow, and how much to pay for tarpaulin material, and that chickens and cows can eat any maize that can't be used and the cobs are coveted fire wood. We will write more within a couple of weeks. NYASAYE OGWEDHI (nia sah eay o gway dee) - GOD BLESS YOU!